Functions: hours, minutes, small seconds at 3 o'clock. Skeletonised date at 6 o'clock. Chronograph: 30-minute counter at 9 o'clock, central seconds. Tachymeter scale on the flange. 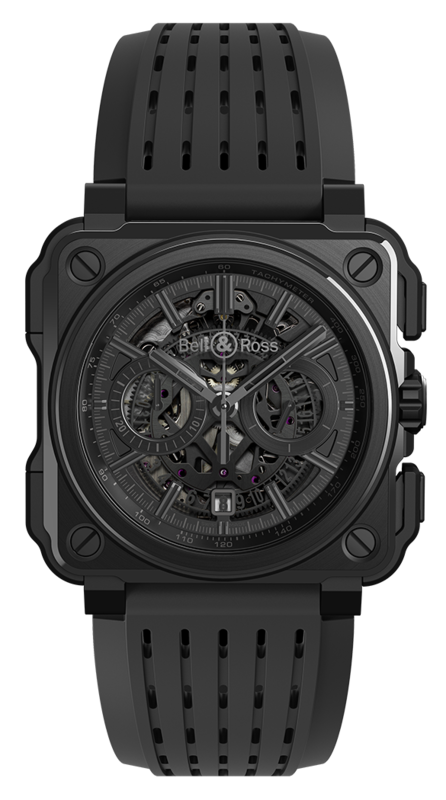 Case: 45 mm in diameter.Black PVD titanium and matt black ceramic with rubber inserts. Rocker push-buttons. Case-back with opening in tinted sapphire crystal, centred on the balance. Buckle: pin. Black PVD steel with black rubber overmoulding.